Munsell Color is one of my favorite companies. When I was the lab manager at AATCC (the American Association of Textile Chemists and Colorists), I was responsible for their quality control aids which included the Gray Scales and Chromatic Transference Scales. When I started there in 1986, these were being produced by a very small company in New Jersey. Half were rejected because of poor contrast or defects and they could not produce enough to meet demand. We were a year behind on filling orders. The situation was ridiculous. I found a letter in the files from Louise P. Galyon at Munsell Color offering to produce them, but there was political opposition and also a requirement that we order a minimum number of units. I took a risk and switched. The quality was the best ever and our sales tripled. Later, I had a request from the Carpet Committee (RA 57) to develop a larger scale for evaluating field carpet failures. Instead of the small chips used in the existing scale, the Jumbo Scale employed matching grey chips that are about 20 X 10 cm. I estimated the cost to be $150/set. I described my plan at a research committee meeting and took orders for 20 sets without having anything to show. I designed what became known as the “Jumbo Gray Scale” (name suggested by Dr. Suga in Japan) and it was big success. Louise did a great job in production. Hers and my initials were put on the scales. 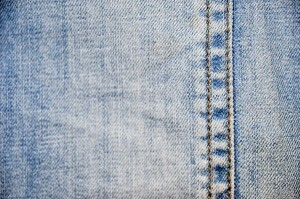 In denim and other parts of textiles, color control is abysmal. Very few people in textiles understand the 3-dimensional color measuring systems, they just crank out millions of numbers that they cannot understand. While it is common for the fashion houses to use the Farnsworth Munsell 100 Hue Test to qualify colorists, the denim business is more subjective with regard to color evaluation. Rather primitive, in fact. Indigo dyeing is unique because of the necessity for applying the dye in multiple dye baths, building the shade a little at a time. The dyeing process leaves the center of the yarns an un-dyed white and the Indigo dye molecule is so different that it produces an appearance that cannot be duplicated by any other dye. Also, there is no direct relationship between amount of dye and the depth of shade. 2% of Indigo on weight of yarn can produce a very light color or a very dark one, depending on the dyeing method. 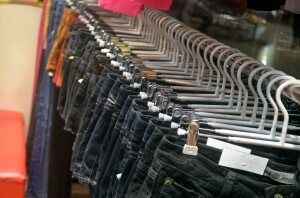 When individuals among denim producers or denim customers attempt to judge the depth or differences in depth of denim yarns, fabrics or garments, the results are wildly inconsistent. The Gray Scales for Color Difference produced by Munsell Color are an excellent standard reference for making visual comparisons in denim when used according to AATCC Evaluation Procedure Number 1. 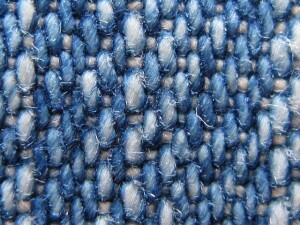 Depth is a very important factor in all textiles, but especially in denim. Depth is a visually perceived concept and does not reliably relate to instrumental measurements. At one time there were sets of Standard Depth Scales that were available in a number of colors that allowed assessment. By using the Gray Scale for Color Change or the Chromatic Transference Scale, produced by Munsell Color for AATCC, differences in color depth can be evaluated and communicated reliably. The main issue in Indigo dyed textiles is how quickly and consistently the color fades when the garment is laundered. I can estimate visually by observing the degree of brightness or dullness (chroma), by how reddish or greenish the tone and by the starting depth. Most denim contains a second dye, sulfur black, which is a dull, low chroma dye in addition to the high chroma, bright Indigo which complicates evaluation. It occurred to me that by using tinted transparencies, combined in layers, different shades could be standardized. There should be a special rating system for Indigo. The Munsell Color system is, to my mind the best and simplest for color communication and control. I have a 1915 edition of the Munsell Book of Color and I still use it to teach color science. I think it is the most effective way to communicate color objectives. As for the Farnsworth Munsell 100 Hue test, it needs to be employed. Anyone responsible for determining color accuracy should be tested for color acuity. I cringe whenever I walk in on an argument where people without the proper testing and training are simply eyeballing color. 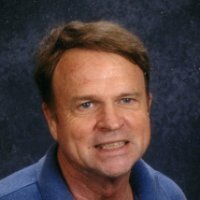 Harry Mercer is the President of Indigo Blue, the leading source for Indigo dyeing, color matching and denim product development in the world since 1994.